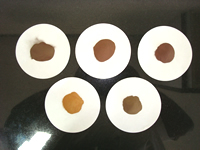 Copper-based Alloy Powder at RGB is produced by Hydra Atomization process. Copper, Lead, Tin etc., in the form of virgin metals are melted down and disintegrated into fine droplets by means of a high velocity atomizing medium. The metal droplets cool and solidify as they settle at the bottom of the atomization tank. The slurry is transferred to a dual cone drier for drying. 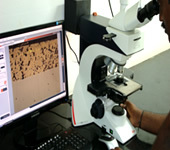 The dried powder is sieved to get the required distribution of particles and blended to get a homogeneous mixture. 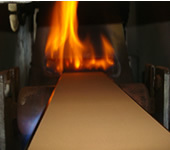 Cold rolled steel strips are cleansed thoroughly for sintering. 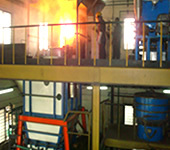 The pre-mixed bearing alloy powder is spread over the continuously moving prepared steel strip which advances into a multi zone furnace under reduced atmosphere. The powder particles reach a semi molten stage to attain metallic bond. The strip is then compacted to increase the density and re-sintered to improve the bond strength and to achieve the final desired size. The Sintered Bimetal strip is slit to the required width for manufacture of Plain Shaft Bearings, Bushings and Thrust Washers. 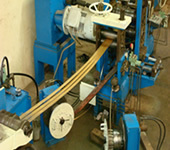 Bimetal strips are produced in coil forms of 610 mm I.D. 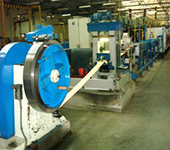 Cold rolled steel strip is prepared thoroughly for casting. 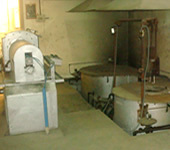 The bonding surface is tinned, before the Babbitt alloy is cast on the surface followed by water quenching, Milling and Knifing to achieve the final desired size. Bimetal strips produced at RGB undergo strict laboratory evaluation such as visual, dimensional, physical/chemical and micro structure examination. Cold rolled steel strips used in the manufacture of Bearings, Bushings and Thrust Washers confirms to SAE 1008, SAE 1010 and SAE 1020 standards. Steel backing not only increases the mechanical strength but also holds to a minimum dimensional change caused by thermal expansion. Sintered Antifriction and Friction parts at RGB are also produced by Pressure Sintering Process. The premixed powder is compacted to the required shape in a rigid steel carbide die using high compacting pressure. The resultant green piece is pressure-sintered to a steel backing in a controlled atmosphere furnace thus achieving a metallurgical bond. At RGB, Copper and Babbitt alloys are also centrifugally cast onto steel shells for manufacturing thick walled bearings and bushings, used in locomotive, industrial and other applications. 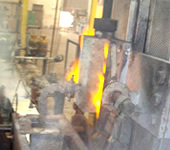 The process involves preheating of the steel shells and casting bearing alloy onto it in specially designed casting machine with auto speed and quench control techniques for better micro structure of the bearing material. 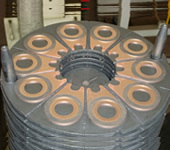 Overlay plating in an engine bearing is made of thin plated surface layer (0.025 mm thick) of Lead-Tin-Copper over nickel. The Babbitt overlay provides embedability, long life and superior performance. 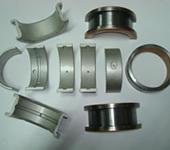 Copper Lead Bearings and Bushings are plated with the above soft overlay in an excellent facility available in-house. 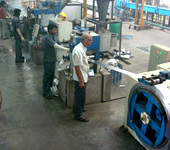 A dedicated tool room facility with state-of-the-art machineries for manufacturing dies, moulds, fixtures, press tool etc.,is available in house.